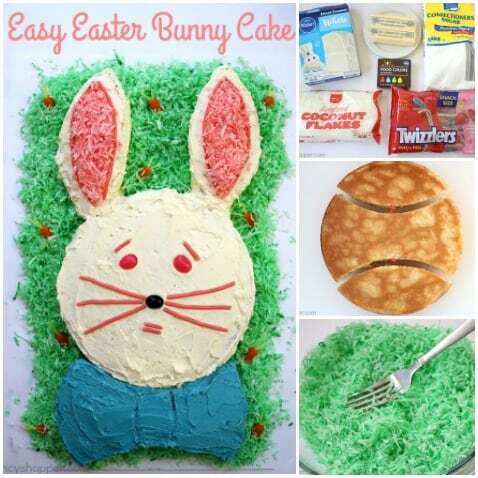 This Easy Easter Bunny Cake will be perfect for your after dinner dessert. Since we start with a boxed cake mix, it is super simple. Let the kids help decorate… they will LOVE it! This is one of those cakes that is super fun for kids or adults to make. 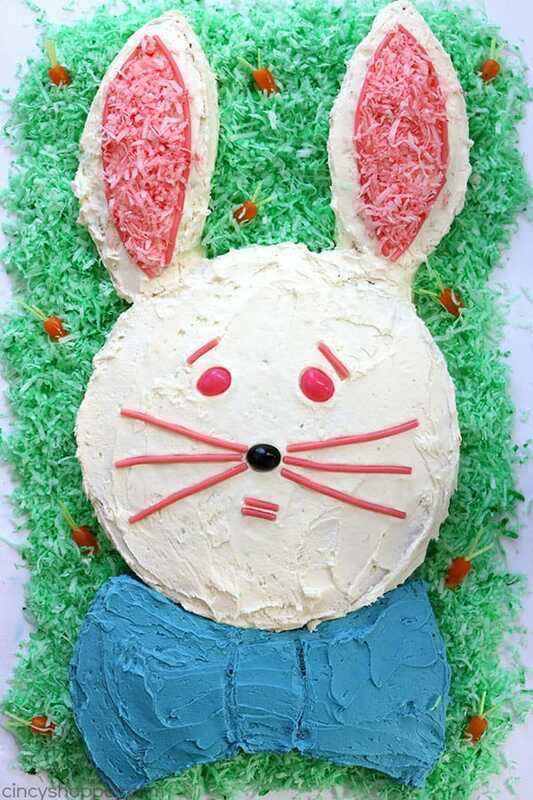 With just two round cakes, you can create this cute little guy for Easter dessert. Just frost him for the kiddos and let them decorate. 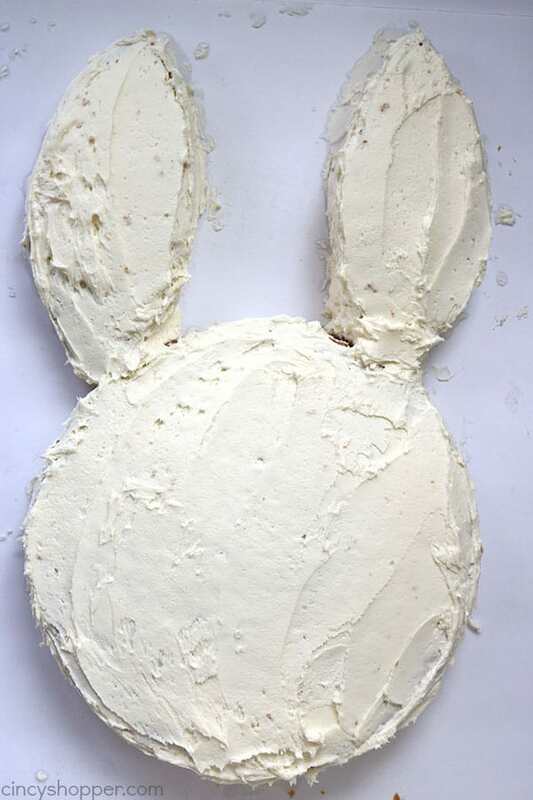 They will love that they helped create a bunny cake for Easter. Grab yourself a cake mix. We used a plain white, but you could use any cake mix. I think a strawberry or even a Funfetti would be great for Easter. 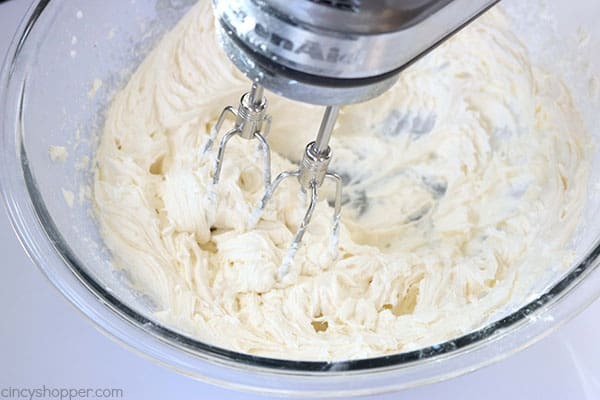 You can use store bought frosting if you want to keep this recipe super simple. We used our homemade buttercream to frost ours. 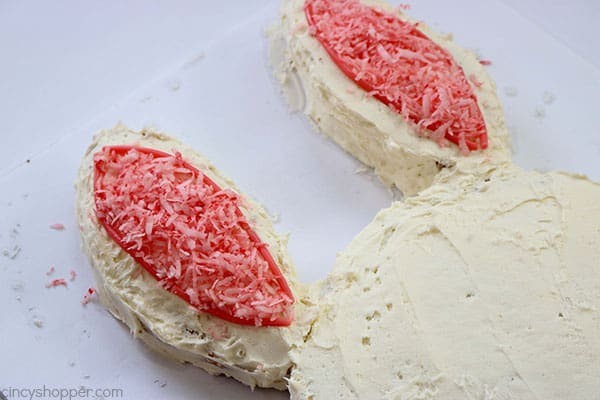 The coconut is not needed if you would like to omit it but, we think that the green coconut for grass and the pink coconut on the bunny’s ears makes him a bit more festive. Jelly beans make great eyes and nose. We used some rip apart Twizzlers for our whiskers and outline on the ears. 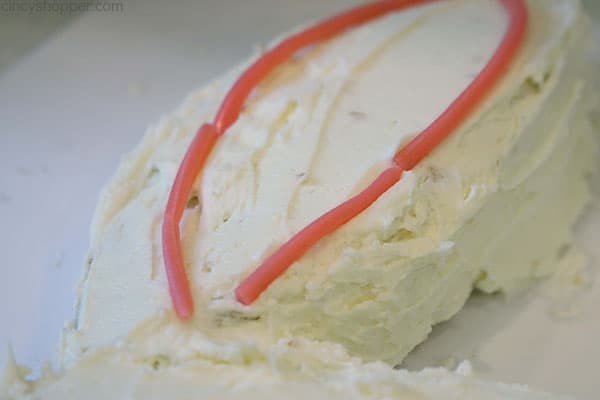 Oh also, if you want to add in some of the cute little carrots, they are the same ones we used in our Easy Easter PEEPS Poke Cake. I thought they added a bit more to the grass. 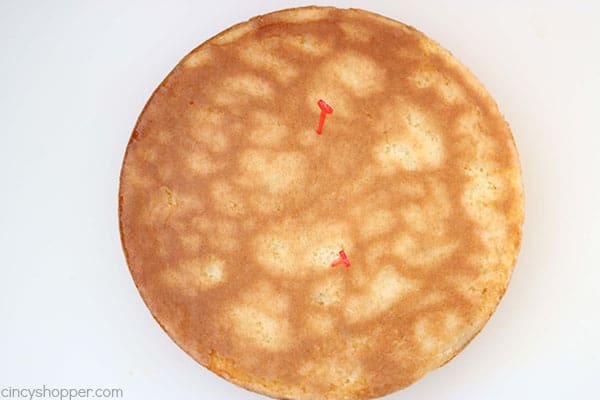 Make cake according to box directions for two 9″ layers. Beat butter and gradually add in powdered sugar until blended and fluffy. Transfer 1/3 of frosting to seperate bowl. 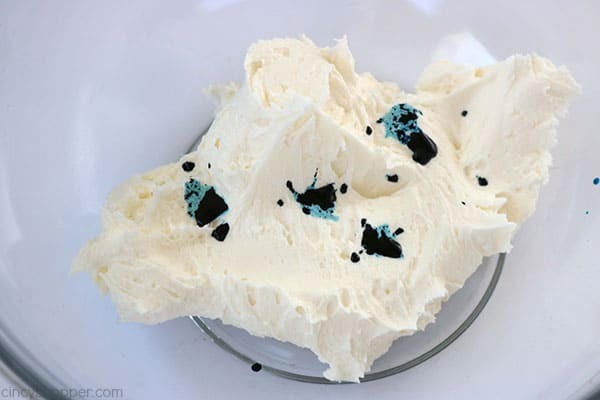 Add blue food coloring to small bowl and whip to blend color. 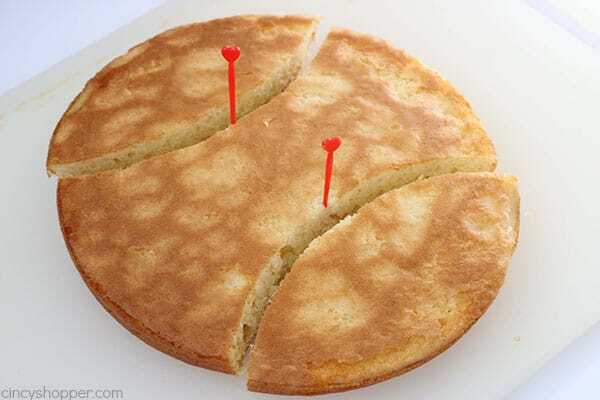 Measure across center of one of cake layers and mark with a toothpick 3″ in from each side. 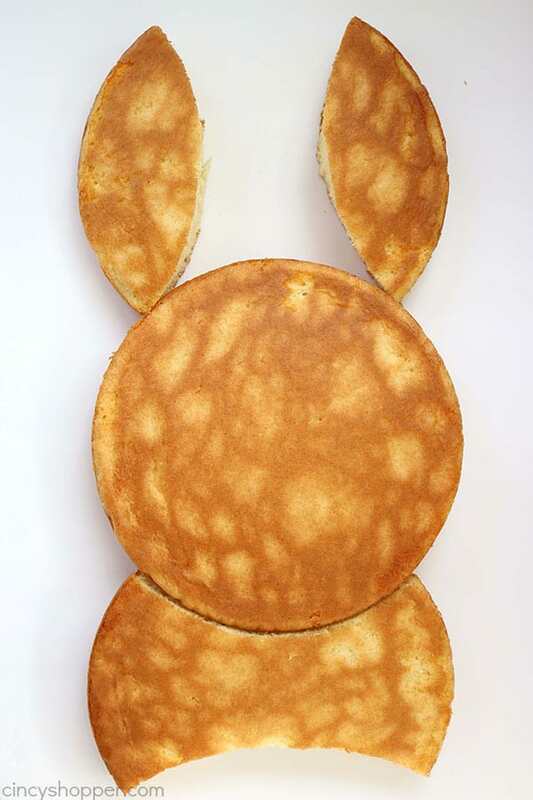 Using a large pan lid (about 12″) Cut ears from each side, leaving bow tie. Position pieces as shown and frost head and ears with white frosting. Position bow tie and frost with blue frosting. Place 1/2 cup coconut in small bowl and add red food coloring while stirring with fork to distribute. 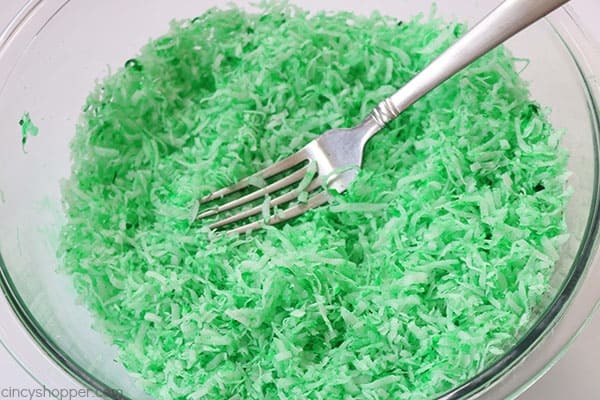 Place remaining coconut in large bowl and add green food coloring while stirring with fork to distribute. Position black jelly bean as nose and pink jelly beans as eyes. Separate Twizzlers and use pink pieces to outline ears, make whiskers and mouth. 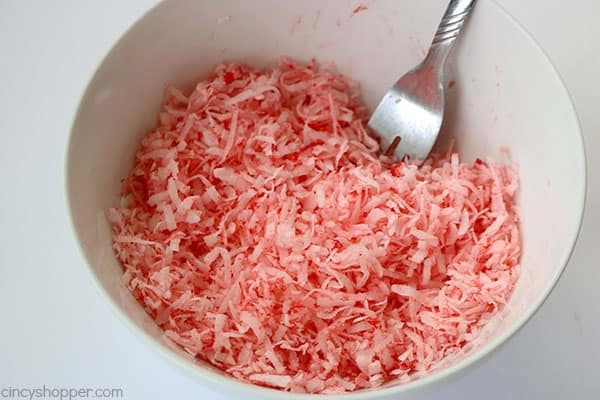 Use pink coconut to fill in ears. Use green coconut around outside of cake. 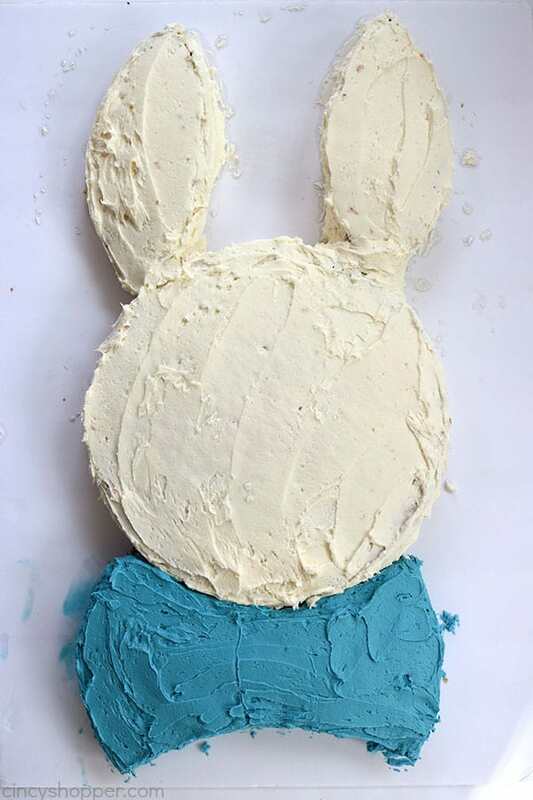 This Easy Easter Bunny cake is one that you will want to share on your Pinterest Easter boards. Or… share it with friends and family on Facebook. Everyone loves how simple the idea is. 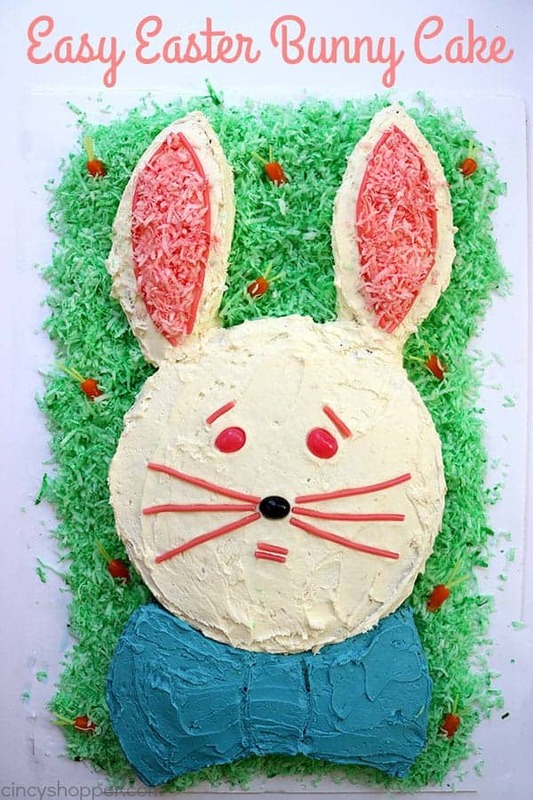 This Easy Easter Bunny Cake will be perfect for your after dinner dessert. 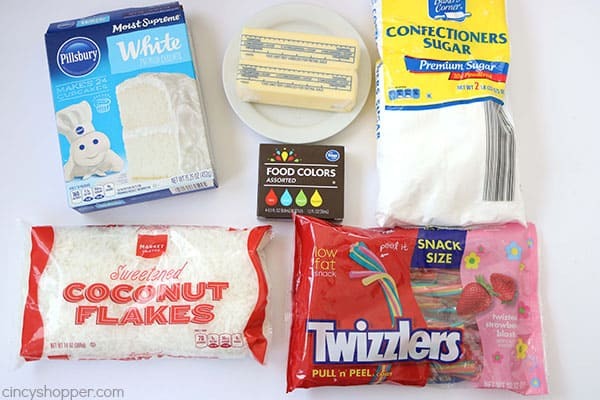 Since we start with a boxed cake mix, it is super simple. Let the kids help decorate.... they will LOVE it! 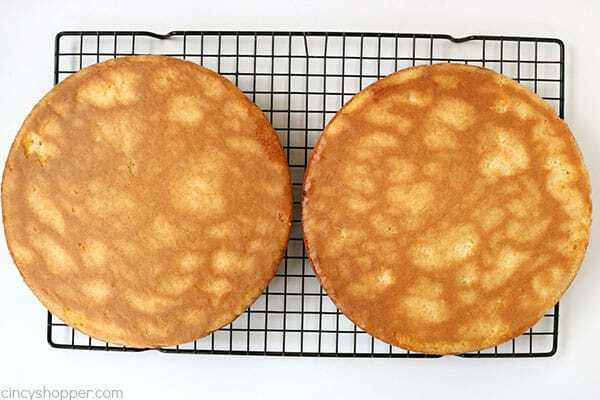 Make cake according to box directions for two 9" layers. 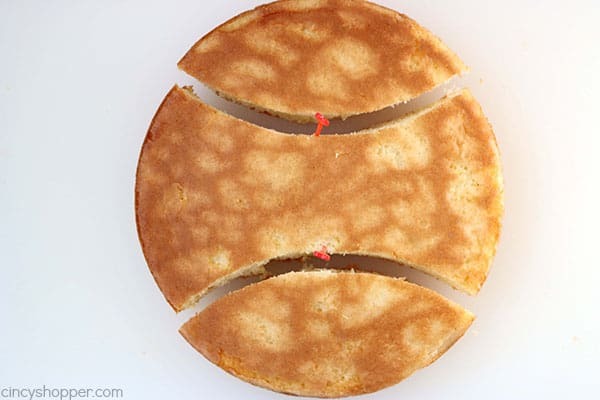 Measure across center of one of cake layers and mark with a toothpick 3" in from each side. Using a large pan lid (about 12") Cut ears from each side, leaving bow tie. This one brings back sweet memories for me. Mom started making these back in the late 70’s I think. She would make it every year. Love the Easter Bunny Cake. Yours is so pretty!